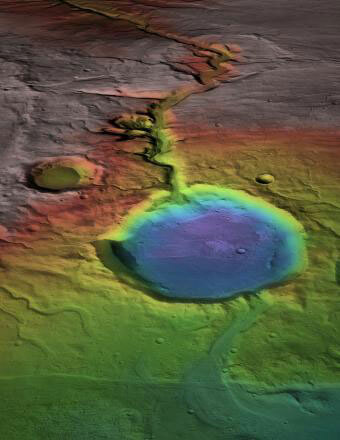 There is ample evidence that water once flowed on the surface of ancient Mars. But that evidence is difficult to reconcile with the latest generation of climate models that suggest Mars should have been eternally icy. A new study suggest that warming and water flow on Mars were probably episodic and related to ancient volcanic eruptions. 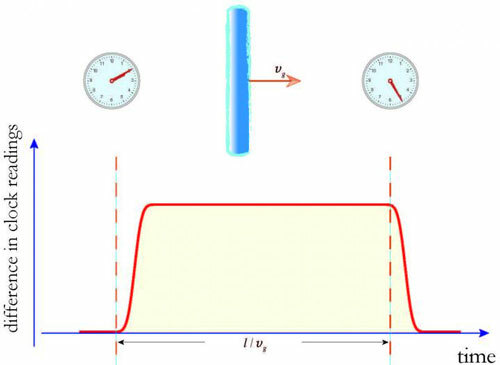 The everyday use of a GPS device might be to find your way around town or even navigate a hiking trail, but for two physicists, the Global Positioning System might be a tool in directly detecting and measuring dark matter, so far an elusive but ubiquitous form of matter responsible for the formation of galaxies. 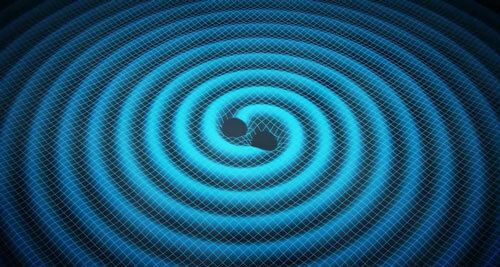 When two detectors are switched on in the US next year, researchers hope their research will help pick up the faint ripples of black hole collisions millions of years ago, known as gravitational waves. One of the mysteries of the Universe is the question of how all the galaxies we see around us came to be. 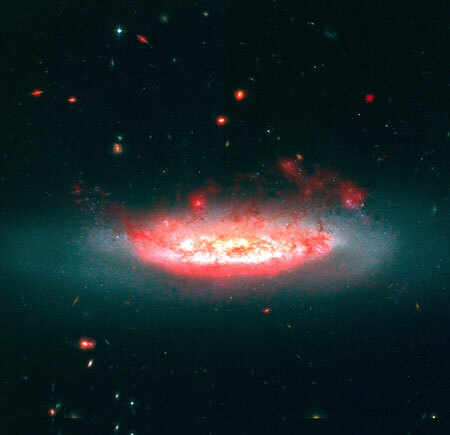 Astronomers have now uncovered new insights into the processes that have shaped galaxies, using the Hubble Space Telescope and Chandra X-ray Observatory telescope. 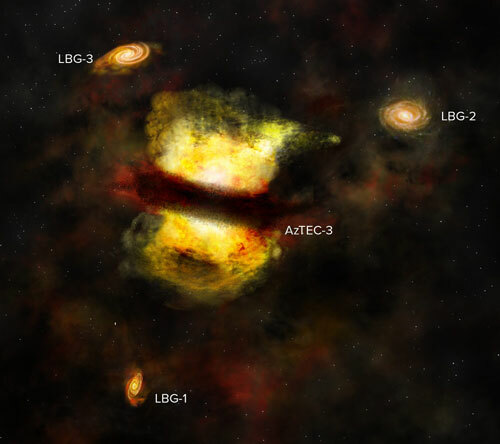 Astronomers have provided the first direct evidence that an intergalactic 'wind' is stripping galaxies of star-forming gas as they fall into clusters of galaxies. The observations help explain why galaxies found in clusters are known to have relatively little gas and less star formation when compared to non-cluster or 'field' galaxies. 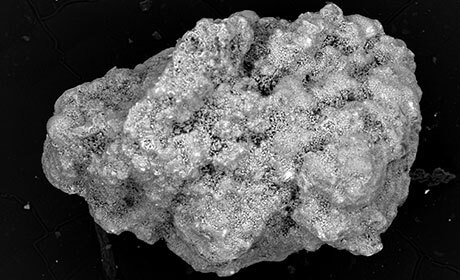 Chloromethane discovered on the Red Planet possibly comes from the Martian soil - meteorites probably provided its carbon and hydrogen. 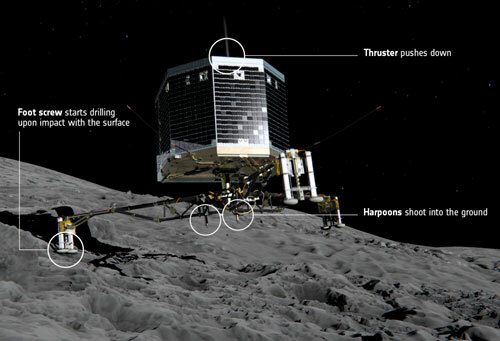 The first attempted landing on the surface of a comet is a huge landmark in the history of space exploration that will not only uncover further details about comets but could unlock further clues about the origins of our solar system and the development of life on Earth. 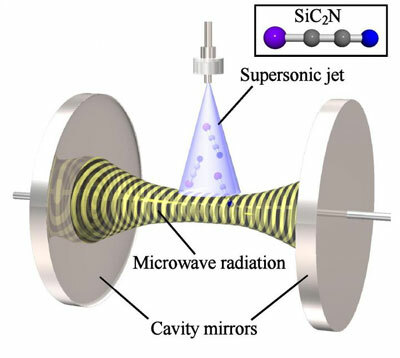 First time laboratory detection of silicon and nitrogen-terminated carbon chain molecules could help astronomers get a more complete picture of interstellar chemistry. 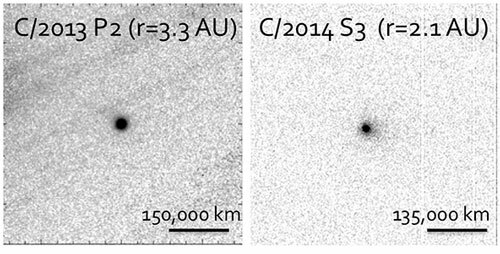 Astronomers are announcing today the discovery of two unusual objects in comet-like orbits that originate in the Oort cloud but with almost no activity, giving scientists a first look at their surfaces. These results are particularly intriguing because the surfaces are different from what astronomers expected. Nestled among a triplet of young galaxies more than 12.5 billion light-years away is a cosmic powerhouse: a galaxy that is producing stars nearly 1,000 times faster than our own Milky Way. This energetic starburst galaxy, known as AzTEC-3, together with its gang of calmer galaxies may represent the best evidence yet that large galaxies grow from the merger of smaller ones in the early Universe, a process known as hierarchical merging. 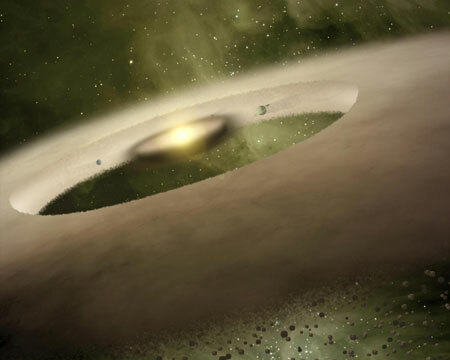 Astronomers have discovered two dust belts surrounded by a large dust halo around young star HD 95086. 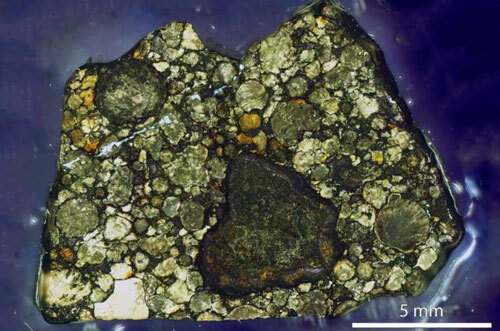 The findings provide a look back at what our solar system may have resembled in its infancy. Observations with the ATCA and ALMA radio telescopes have shown signs of something never seen before, located at the center or the remnant of a supernova. It could be a pulsar wind nebula, driven by the spinning neutron star, or pulsar, which astronomers have been searching for since 1987. Light pollution is not only a problem for astronomy. Scientists from the interdisciplinary project 'Loss of the Night' study how it affects health, society, and the environment. 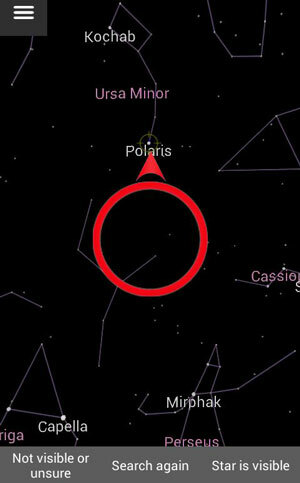 In order to measure how skyglow is changing, they have developed an app for smartphones, which allows citizen scientists to count the number of visible stars in the night sky. 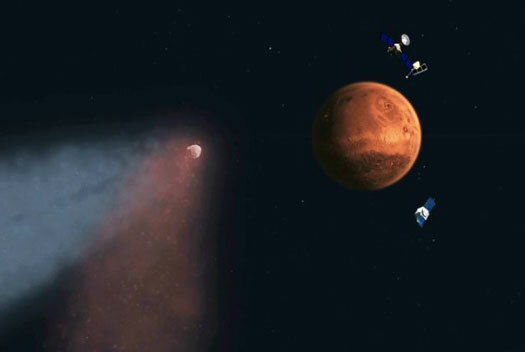 Two NASA and one European spacecraft have gathered new information about the basic properties of a wayward comet that buzzed by Mars Oct. 19, directly detecting its effects on the Martian atmosphere. 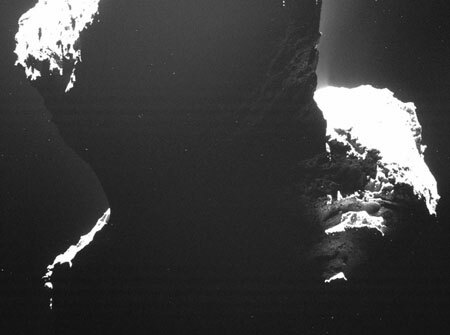 Light scattered from dust particles allows a first glance at the side of comet 67P that has been trapped in the darkness of polar night for the last months.